8 all natural Gourmet Sauces have been created. Richard's BBQ Sauce is a Vermont Made Barbecue Sauce, crafted in Vermont from all natural, fresh ingredients and our family's favorite barbecue sauce recipe. Our barbecue sauces are not organic but truly all natural, gluten free, no high fructose, showing up on picnic tables... in restaurant kitchens... and even in wedding celebrations across the country. Richard's HOT SAUCE: A wonderful condiment with enough heat to peak your interest but still brimming with flavor. All natural with only quality ingredients, it will become a family favorite. Full bodied flavor in heat. The symphony begins with a tantalizingly tangy burst. 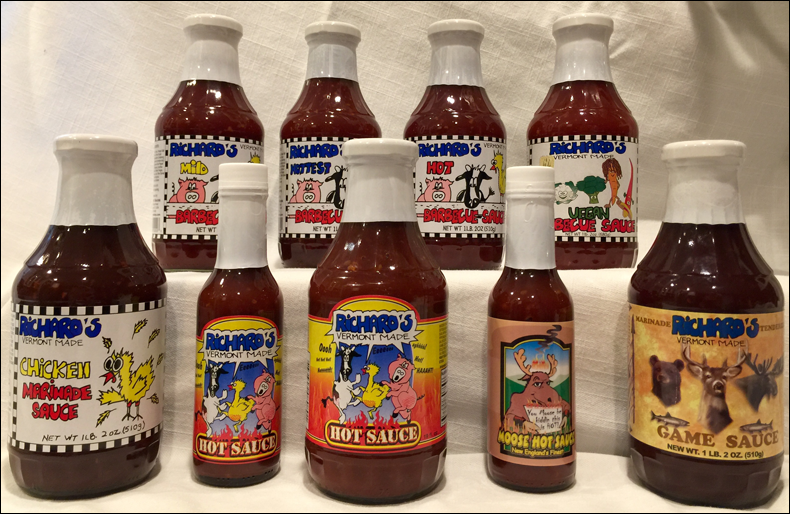 Richard's Hot Sauce proves you no longer have to sacrifice flavor for heat. Let your taste buds dance in the perfect harmony of flavors expertly composed to be the ideal accompaniment to any meal. 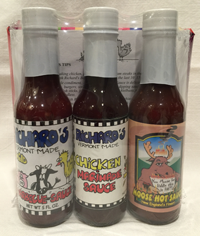 Richard’s Hot Sauce is a small batch, hand crafted gourmet hot sauce. 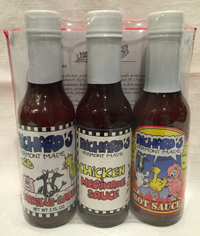 Rich and flavorful, Richard’s Hot Sauce is great for grilling, dipping or as a marinade. Go with the flow! 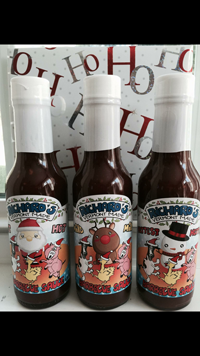 Holiday 3 pack contains 3 5 oz bottles, one each of Mild, Hot, & Hottest BBQ Sauce. $13.00 per pack. Our Barnyard Label available in a 5 Oz bottle.